Yesterday’s Question answered below: Where is the Great White Way? 1524- The Chevalier Bayard, called the Knight without Equal and above Reproach, was killed covering the French rearguard after the battle of Romagnano. Bayard was considered the last of the great Knights of the Realm. France uses his death to count as the End of the Middle Ages. Fittingly the armored knight was shot down by a rifle- a harquebus to be exact. When the fatal bullet struck him Bayard drew his sword and kissed the handle skyward as a sign of the Cross. As the Chevalier’s remains were brought out of Italy to Grenoble, simple peasants came out to carry the coffin aloft from hand to hand for miles. At a time when nobles were despised Bayard was beloved of all people. 1789-FIRST PRESIDENT OF THE UNITED STATES-wearing a suit of Connecticut homespun and a sword on his hip, George Washington was inaugurated on the balcony of Federal Hall in New York as the first President. John Hancock and John Adams were always annoyed that they weren't made first president before him. Thomas Jefferson originally thought the position of elected ruler ridiculous "So they've saddled us with a Polish King." (The Kings of Poland at the time were elected figureheads with little power). Jefferson was made first Secretary of State and felt the position was so useless since we had no foreign policy he asked to also be made attorney general so he could do something to pass the time. 1900- John Luther Jones, called CASEY JONES died in a spectacular train crash near Vaughn Mississippi. Jones' freight train was running 75 minutes late so he stoked up his engine to 100 mph. Suddenly a switching error put a passenger train in his path. Jones stayed at the controls trying to stop the train while his crew jumped to safety. There was a head on collision but because of Jone’s bravery his was the only death. A brakeman later wrote the famous folksong. Union activists prefer to remember that Jones was a strikebreaker running his train recklessly in defiance of a strike to impress his employers. The union still paid his widow his $3000 dollar life insurance. Folksinger Joe Hill in his song "Casey Jones the Union Scab." tells how when he went to heaven the Angel’s Union Local #23 "fired Casey down the Golden Stair.."
1993- The Walt Disney Company announced its’ purchase of top independent film producer Miramax. Ten years later a feud with Michael Eisner caused Miramax founders the Weinsteins to leave and form another company, and last week saw the Weinsteins seeking to buy back the hollow wreck of their old company..
1997- In the last show of the season, comedian Ellen Degenere’s character Ellen admits to Laura Dern that she’s gay. Disney promptly cancelled the Ellen Show. Yesterday’s Question: Where is the Great White Way? Answer: In New York City, the Broadway theater district between 42nd and 53rd St. Since the 1880s, the street was illuminated by big arc lights, that emitted a strong white light. In 1902 The New York Telegram referred to the area as the Great White Way, and the name stuck. Question: Where is the Great White Way? Yesterday’s Question Answered Below: Say you are an Arizona State Trooper. Which one of these people is NOT Hispanic? A) Charles Bronson, B) Rita Hayworth, C) Martin Sheen, D) Reggie Jackson. In Japan this is a flower festival that originally celebrated the Emperor Hirohito, since his death, his name was changed to the Emperor Shoah. 1818- The ARBUTHNOT & ARMBRUISTER INCIDENT- Henry Arbuthnot was a 70 year old British merchant who sympathized with the Seminole Indians of Florida. Together with a former Major Armbruister they aided this tribe in it's struggle with the expanding United States. When U.S. Gen. Andy Jackson invaded Spanish Florida in 1818 he captured these men. Jackson nursed a hatred of English people since as a young boy in the Revolution he was humiliated and slashed with a saber by a redcoat officer. Jackson’s mother and older brother died in an English prison. So Jackson was not interested in hearing essays on native rights or the eccentricities of Britishers. He executed them on the spot, hanging old Arbuthnot from the mast of his own schooner. This mistreatment of foreign nationals proved an embarrassment to President Monroe and earned Jackson a reputation for cruelty that would follow him to his own presidential runs. 1992- THE GREAT LOS ANGELES RIOT- Los Angeleanos go berserk after an all white jury in Simi Valley acquitted the policemen who beat up drunk motorist Rodney King while being videotaped. 58 killed, 2500 businesses destroyed, $1.5 billion dollars in damage, 13,200 arrests and large sections of Los Angeles put under martial law. Even Rodney King was moved to go on TV and proclaim: " Can't we all just get along?" Part of the reason the disturbance spun out of control was the hotheaded police chief of the LAPD Darryl Gates was incommunicado for several hours at the beginning of the crisis. He was at a fundraising party in Bel Air to get money to fuel his quarrel with Mayor Tom Bradley. One irony was the loot-crazed mob ran right past the L.A. County Art Museum to sack a department store on the next corner. I guess they felt that there was nothing of value in it, which is in agreement with many art critics. The Beverly Hills Police, a separate entity, kept the peace by arresting everyone they saw. Yesterday’s Question: Say you are an Arizona State Trooper. Which one of these people is NOT Hispanic? A) Charles Bronson, B) Rita Hayworth, C) Martin Sheen, D) Reggie Jackson. Answer: A) Charles Bronson was the son of Polish-American Pennsylvania coalminers. Quiz: Say you are an Arizona State Trooper. Which one of these people is NOT Hispanic? A) Charles Bronson, B) Rita Hayworth, C) Martin Sheen, D) Reggie Jackson. Answer to yesterdays Quiz- Why is a traitor called a turncoat? Godzilla is 55- see below-1954. The word "assassin" comes from "hash-a-shin" or "eaters of Hashish". Their leader Sheik Ibn-Abdel Sinan, was called :"The Old Man of the Mountain" established his cult on a mountain fortress in Lebanon. He got his followers stoned in a pleasure garden filled with pretty girls, telling them they had just spent time in Paradise. And if they were good he’d let them in for more visits. Sheik Abdel Sinan ran his sect like an extortion racket throughout the Middle East. In exchange for gold he wouldn't have one of his stoned followers knife you. When the Crusaders arrived in the Holyland, no one had clued them in to this system. So when Conrad laughed off the Assassin's emissary, he was stabbed by hitmen disguised as Christian monks. 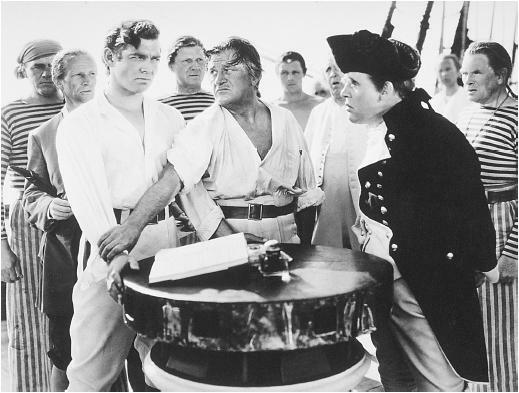 1789-THE MUTINY ON THE BOUNTY. The HMS Bounty had been sent around the world to bring back breadfruit samples to see if the plant could be a nutritional supplement for slave laborers in Jamaica and Bermuda. During the return voyage from Tahiti the crew led by first mate Fletcher Christian, set upon the Captain, William Bligh, and set him adrift in a rowboat to die. They then sail with their Tahitian families to settle permanently on an island. They choose Pitcairn Island because of it's remoteness. Squabbles arose among the British and natives and their leader Fletcher Christian was killed while tending his sweet potato patch. Today a majority of the islands inhabitants claim ancestry from the Bounty mutineers. 1881- Notorious gunfighter Billy the Kid had given himself up to New Mexico authorities on condition he would get a fair trial. That fair trial sentenced him to hang. He was being kept shackled in the town of Maisella New Mexico by two deputies. One guard named Pecos Bob Ollinger enjoyed tormenting the Kid with descriptions of how gruesome his death was going to be- dancing in the air, slowly choking, eyes bulging, etc. At one point Ollinger left his shotgun by the door and crossed the street to have dinner. The Kid asked the other deputy to unshackle him so he could use the outhouse. A friend had secretly planted a gun in the outhouse. When Ollinger returned he found his deputy dead and Billy the Kid pointing his shotgun right at his face. "Hello Bob !" the smiling kid said, then blew his head off. 1944- EXERCISE TIGER-The greatest coup of Axis espionage. German spies discovered that the allies were going to rehearse their D-Day invasion landings off Slapton Sands, England. They sent a surprise attack of torpedo boats across the Channel to catch the defenseless transports packed with troops, bobbing in the water unawares. They sank several drowning hundreds of men in the 44 degree f water. Another big mistake was many of the GIs were wearing their life belts incorrectly around the waist instead of under the arms so when they leapt into the water the belt was useless and their heavy packs dragged them down. More G.I.s died in this incident than at Utah Beach on D-Day. Yet until recently it was all kept top secret. After WWII the head of German espionage, Reinhard Gehlen, had a long happy career in the CIA. 2004- ABU GHARIB-American network news confirmed a story first aired on Arab TV that U.S. and British soldiers were torturing Iraqi prisoners in violation of the Geneva Convention. The government asked the American media to sit on the story, until after Defense Secretary Donald Rumsfeld testified to the 9-11 Commission. Graphic photos went around the internet from a prison called Abu Gharib. It was once a prison used by dictator Saddam Hussein. President Bush and Rumsfeld claimed they had no knowledge the abuses, while in reality documents released said they knew and approved it all in detail. The Pentagon investigations in 2004 cleared all the top officials of any wrongdoing. Just a few low level National Guard soldiers were blamed, and their commander General Jane Kaminski was reprimanded. Yesterday’s Question: Why is a traitor called a turncoat? 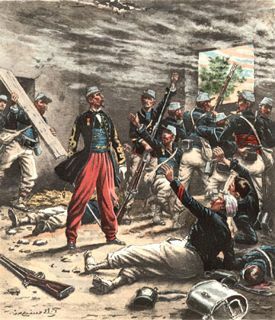 Answer: By the XVIII Century European armies wore brightly colored uniforms to be seen through thick gunsmoke. When someone would desert or change sides, he would wear his uniform coat inside out, to show his decision to the people shooting. Sometimes little states would order their armies to turn coat as a matter of foreign policy. Like in 1813, when the Elector of Saxony had his regiments change sides in the middle of the Battle of Leipzig. Quiz: Why is a traitor called a turncoat? Yesterday’s Quiz: What is a Lothario? 1521- MAGELLAN EATEN- Fernan' De Magellan was the captain who found a way around the Americas to Asia. Although he was ordered to conquer the Portuguese Moluccas he paused after his discovery of the Philippines to convert the population to Catholicism. Magellan tried to demonstrate the power of the Spanish King to the Lord of Cebu, by attacking a village called Mactan, who was the enemy of Cebu. Almost at once everything started to go wrong. First the village was too far inland for his ships cannon. So his men had to wade ashore. In doing so their powder got wet, so their guns were useless. Then while fighting hand-to-hand, a lucky fishbone tipped spear hurled through Magellan's helmet visor and killed him. The Lord of Cebu was unimpressed. The Spanish captains tried to barter for his body, but the tribesmen said such a powerful enemy must stay for dinner. 1861- President Lincoln suspended the Right of Habeas Corpus for the length of the Civil War. The old municipal jail where the modern Supreme Court Building is now, began to fill up with critics of the government, pro-southern journalists and suspected spies. 1865- SULTANA DISASTER- Union P.O.W. 's liberated from the horrible prisons of Andersonville and Libby crowd onto a Mississippi steamboat called the Sultana for the ride home. After embarking from Vicksburg, the boat's boiler accidentally exploded, and sank the vessel, killing 1,700. 1975- The South Vietnamese capitol Saigon is surrounded by North Vietnamese troops. 1981- Ringo Starr married Barbera Bach, his costar on the film 'Caveman'. IN 1988 they went though rehab together and have been happy ever since. Answer: In Cervantes Don Quixote, there is a side story about a man named Lothario who a friend asks to test his wife’s fidelity, and he was the star of a popular play in the XVIII century called the Fair Penitent. Since then, a Lothario is a sleazy seducer of women, more interested in quantity than quality. Quiz: What is a Lothario? Yesterday’s question answered below: What doe these things have in common? A landau, a calache, a surrey and a Berlin? 1478-THE PAZZI CONSPIRACY- Pope Sixtus planed to take over Florence by arranging a hit on Duke Lorenzo de Medici "The Magnificent". Francesco Pazzi and Bernardo Bandini attacked the Duke in church just as the consecrated Host was being raised. Lorenzo escaped harm but his brother Giuliano was slain. Furious Florentines fell on the felons (repeat three times fast) and nailed their smoking hearts to the door of the cathedral. People blamed Archbishop Salviati for being part of the plot. The mob chased the archbishop up the bell tower, wrapped the bell chords around his neck and tossed him out to ring the bells for awhile. The people shouted "Long Live the Balls!" for the six gold balls that were the heraldic emblem of the Medici Family Bank. This emblem of three gold balls has come down to us as the universal sign for pawnbrokers. 1607-THE ENGLISH LAND AT JAMESTOWN....The good ship Susan Constant and two small pinnaces land 150 men . These men were mostly professional adventurers and gentlemen. Capt. Martin and Capt. Archer served with Sir Francis Drake . Of the 150 only 12 men actually could do a trade other than fighting. Their actual purpose was to find Aztec Empires like the Spaniards found in Mexico and send gold back home. In a years time most of them would be dead from fever and cholera. Oh yeah, there was that John Smith guy too. He wouldn’t meet Pocahontas until around Christmas. 1926- The British General Strikes- Unions across Great Britain joins in sympathy with miners to paralyze the nation. Troops and tanks are stationed in WhiteHall for fear of a Bolshevik-style rising.The horrible poverty resulting from defeating the strikers accelerate the Depression already gripping postwar Europe. When the Prince of Wales (future Edward VIII) was shown the medieval squalor the Midlands miners lived in he was deeply shocked, but eyewitnesses said after returning to Kensington Palace for a bath and whiskey, he had quite forgotten about it. 1969- PAUL IS DEAD. The height of a strange rumor that excited the rock & roll world that Paul McCartney of the Beatles had died and the news was being kept a secret. Evidence was presented in the cryptic lyrics of "I am the Walrus", songs played backwards and the record album photo where Paul is the only figure with his back to the camera. A TV special hosted by attorney F. Lee Bailey, the Greta Van Sustren of his day, explored the controversy. Finally, this day Paul and Linda McCartney held a news conference and declared he was very much alive and what on Earth was everyone on about. When one engineer entered the reactor core, he saw the devastation of the explosion while absorbing the radiation equivalent of 23 Hiroshima atomic bombs. He went out and told his supervisor: "Reactor Number Three has exploded." His supervisor told him: "That’s impossible! Go back and look again." So he dutifully re-entered the reactor core, absorbing another 23 atomic bomb’s worth of radiation and came out and said:" Yes, it’s true, it’s really blown up." Yes, he did die shortly afterwards. Yesterday’s question: What doe these things have in common? A landau, a calache, a surrey and a Berlin? Answer: Types of horse drawn carriages.